Research Interests: Insect flight biomechanics, the origins of aerial behavior in hexapods, and the ecophysiology of butterfly migrations. Paul Fine Assistant Professor IB. Curator of Neotropical Phytophagous Insect Ecology and Evolution. Research Interests: Phytophagous insects on the plant family Burseraceae and phytophagous insect communities of forests in Peru, Brazil and French Guiana. Brian Fisher, Curator of Entomology, California Academy of Sciences. Curator of California Bee Pollinator Systems. Research Interests: Native bee-flower-people relationships and pollination ecology in urban, agricultural, and wild lands and bee taxonomy. Curator of Insect Comparative Biomechanics. Research Interests: Arthropod locomotion as it relates to a structure, physiology, and behavior. Robert Lane, Professor of the Graduate School. Curator of Ticks and other Medically Important Arthropods. Research Interests: Biology of ticks, and the ecology epidemiology and prevention of tick—borne diseases, particularly Lyme disease. Vernard Lewis, Cooperative Extension Specialist Emeritus. Curator of Household and Structural Insect Pests. Research Interest: Urban insect pests, particularly, termites and bed bugs, especially the testing of the latest detection and control techniques. Research Interests: Invasive species, biological control, population ecology and insect biology. Research Interests: biodiversity, taxonomy, and systematics of insects, especially microlepidoptera. Alexander Purcell, Professor Emeritus ESPM. Curator of Insect Plant Disease Vectors. Research Interests: Microbial ecology of sap—feeding insects with respect to insect vectors of bacterial plant pathogens, bacterial symbionts and pathogens of Hemiptera. Vincent Resh, Professor Emeritus ESPM. Research Interests: Evolutionary biology and ecology of aquatic insects. Research Interest: Invasion biology, population biology, global change. 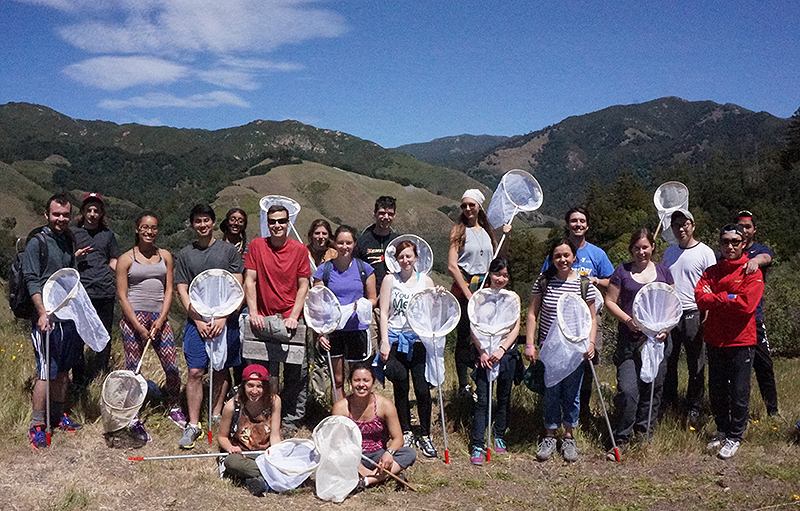 Curator of Genetics, Chemical Ecology, and Behavior of Social Insects. Research Interests: The evolution of communication and behavior of ants and bees. Origin and spread of invasive species. Research Interests: Systematics, Chemical Ecology, Biogeography. Caroline Williams, Assistant Professor IB. Curator of Insect Functional Ecology and Physiology. Research Interests: Mechanisms and consequences of insect responses to emerging winter environments. University of California students trained at the Essig Museum have become leaders in the field of entomology at museums and universities throughout the world, and the list reads like a Who’s Who in Entomology: Peter Ashlock, Richard Bohart, Donald Bright Jr., John Brown, Donald Burdick, John Burns, John Chemsak, John Doyen, Deane Furman, Wayne Gagne, Rosser Garrison, J. Linsley Gressit, Charles Griswold, James Haddock, Kenneth Hagen, Jon Herring, Yu-Feng Hsu, Paul Hurd, Daniel Janzen, Clarence Johnson, Robert Lane, John Lattin, John Lawrence, James Liebherr, E. Gorton Linsley, Evert Lindquist, Don MacNeill, Ronald McGinley, Charles Michener, Charles & Lois O’Brien, Paul Opler, Jerry Powell, Frank Radovsky, Arthur Raske, David Rentz, Fred Rindge, Edward Ross, Jerome Rozen, Constantine Slobodchikoff, Ray Smith, John Sorensen, Wallace Steffan, Catherine Tauber, Robbin Thorp, William Turner, Robert Usinger, Natalia Vandenberg, Robert van den Bosch, David Voegtlin, David Wagner, Marius Wasbauer, Robert Wharton, James Whitfield, Elwood Zimmerman.